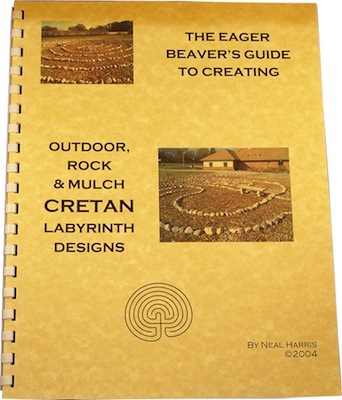 The Cretan manual is a 14 page, step by step guide with color diagrams, for designing various sizes of 7-Circuit, Classical, stone and mulch Cretan labyrinths. The Cretan manual is especially good for groups to be able to lay out this design and quickly construct. The Cretan labyrinth is one of the oldest (4000 years or more), simplest and most widely used labyrinth pattern in the world. It’s name was derived from an early representation on the Isle of Crete. It is also referred to as the Classical 7-Circuit design and can be used as a template for the seven major energy centers of the physical body known as Chakras. Understanding the quality of each of these energy centers as it relates to a specific path or circuit on the design, assists you to consciously gain insight into and ferret out answers to the complexities of life. The Cretan looks like the cross section of a human brain and has therefore been used effectively to assist those with Dyslexia, ADHD, neurological disorders etc. Let this Cretan manual guide you in the building process of this design in a clear, easy, step-by-step manner.